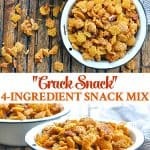 ​​​​​​​The ultimate crowd-pleasing party food, this "Crack Snack" is a 4-ingredient sweet and salty snack mix recipe that earned its name for a reason! The ultimate crowd-pleasing party food, this “Crack Snack” earned its name for a good reason! 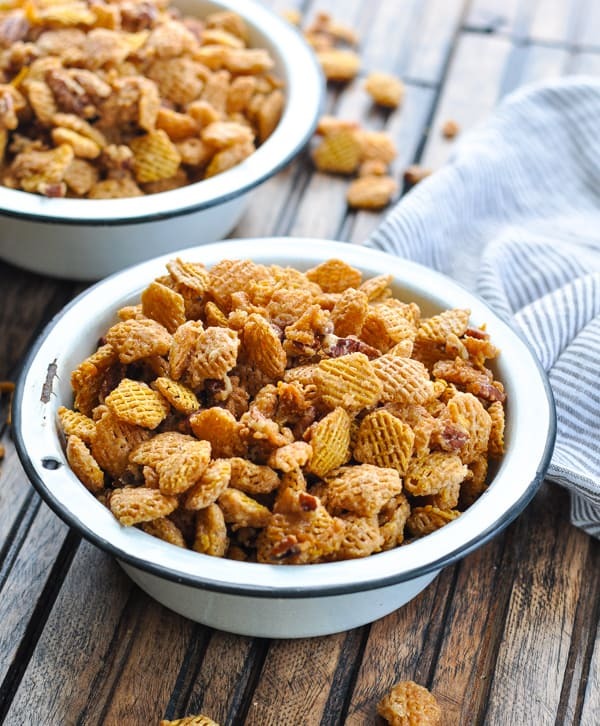 With just 4 simple ingredients, you can whip up this crunchy, sweet and salty snack mix in a matter of minutes! 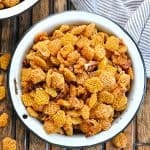 My friend Kaci recently shared this cereal snack mix recipe with me, and I instantly knew that it would be a hit. It’s fast, easy, requires just a few ingredients, and it tastes amazing. So amazing, in fact, that it’s hard to stop eating. Hence the name! 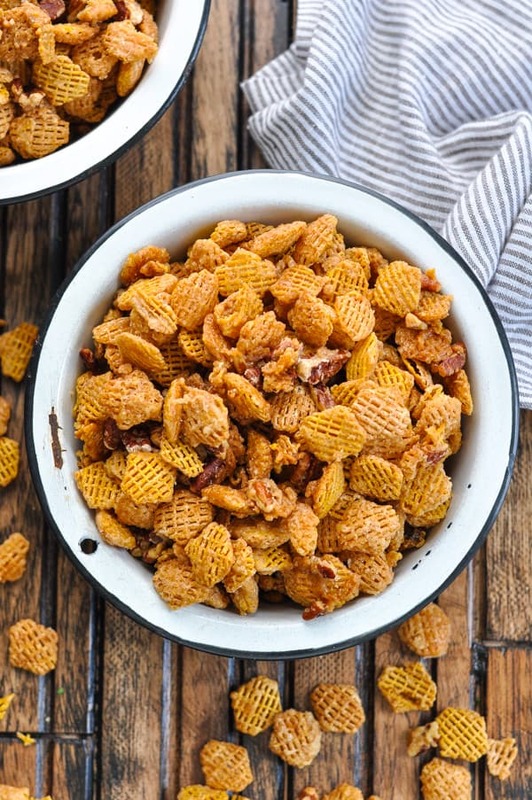 This sweet and crunchy snack mix would go perfectly paired alongside other potluck munchies like my 3-Ingredient Queso Dip, Make-Ahead Ham and Cheese Sliders, and 3-Ingredient Bacon-Wrapped Chicken Bites. Packaged in a cute container, it’s also a great holiday snack mix for gift-giving, so grab these ingredients and whip up a batch STAT! 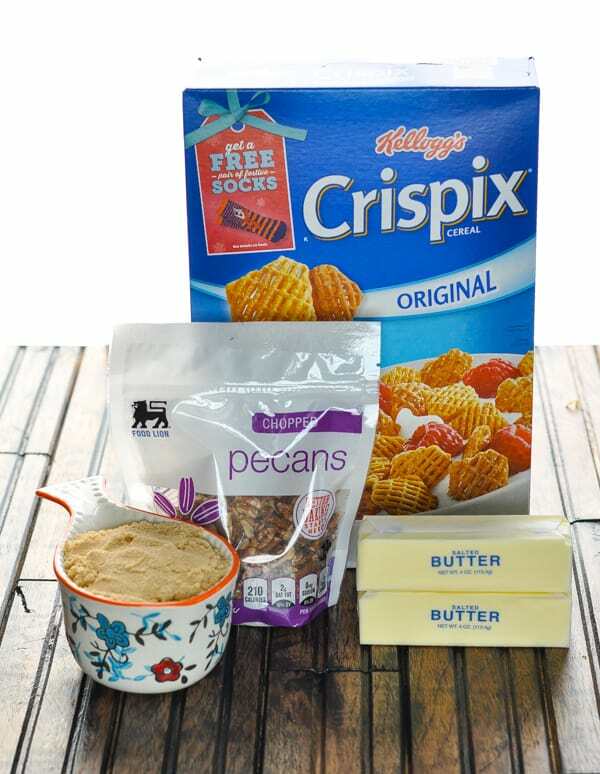 Let’s start with the basics: a box of Crispix cereal, salted butter, chopped pecans, and brown sugar. First, line a baking sheet with foil and spray with cooking spray. Spread the cereal and the pecans on the baking sheet and set aside. Next, combine the butter and the brown sugar in a saucepan. Boil the mixture for 2 minutes, stirring constantly, until a thick, creamy caramel sauce forms. 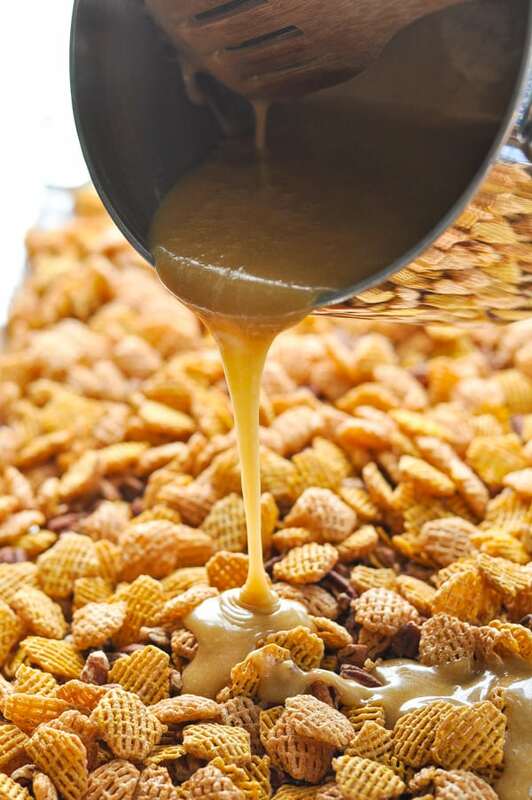 Pour that sweet, buttery sauce over the cereal and nuts. Use a spatula or wooden spoon to toss until the sauce coats the Crispix and pecans. 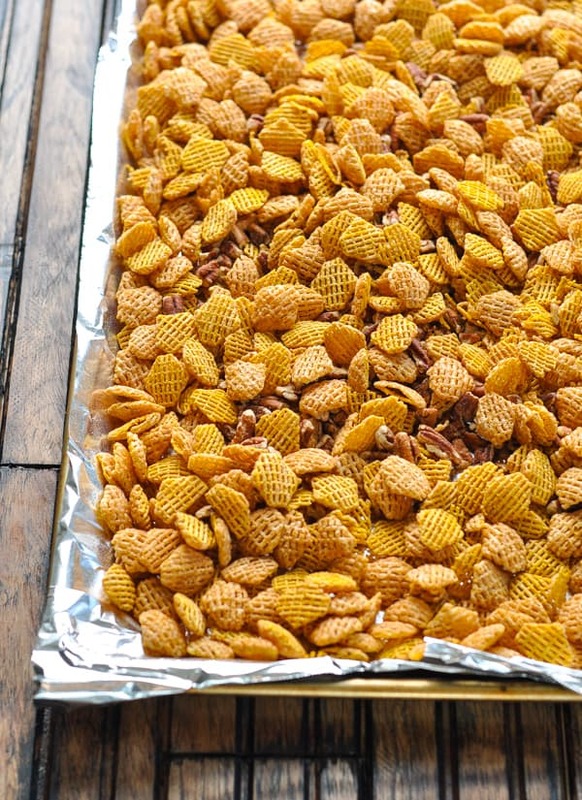 Bake the snack mix in a 325-degree F oven for 16 minutes (stirring halfway through). The end result is this sweet and salty party mix that has a perfect balance flavors and textures! Mix it up and use peanuts or almonds instead of the pecans. Make it a Chex Mix by swapping out the Crispix and using a combination of different Chex cereals instead (such as Rice Chex, Corn Chex and Wheat Chex). 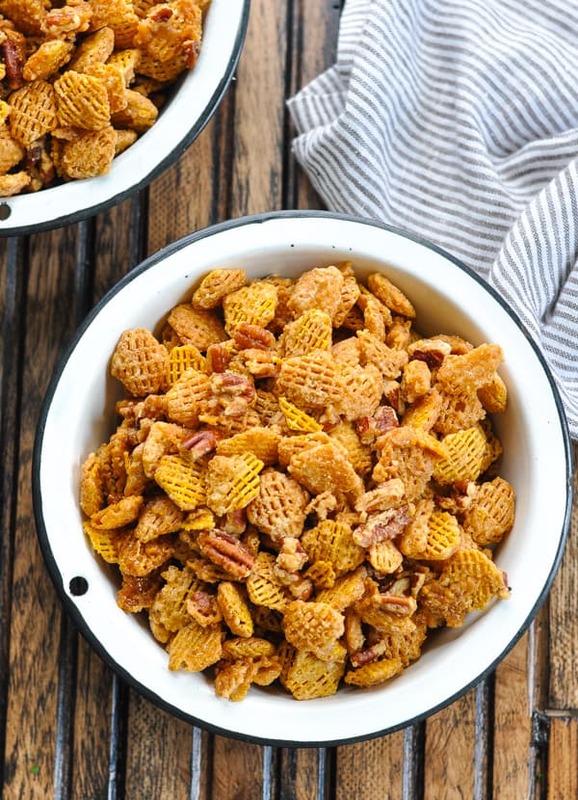 Use salted butter for this party mix recipe, which gives the dish a great sweet and salty flavor combination! As the mix starts to cool, use a wooden spoon or spatula to break up some of the larger clumps. Store in an airtight container for up to 5 days, or package in cute bags or boxes and deliver to family, friends, and teachers for homemade holiday gifts! Preheat oven to 325 degrees F. Line an extra large baking sheet (or two smaller baking sheets) with foil and spray with cooking spray. Spread cereal and pecans on prepared baking sheets. Set aside. 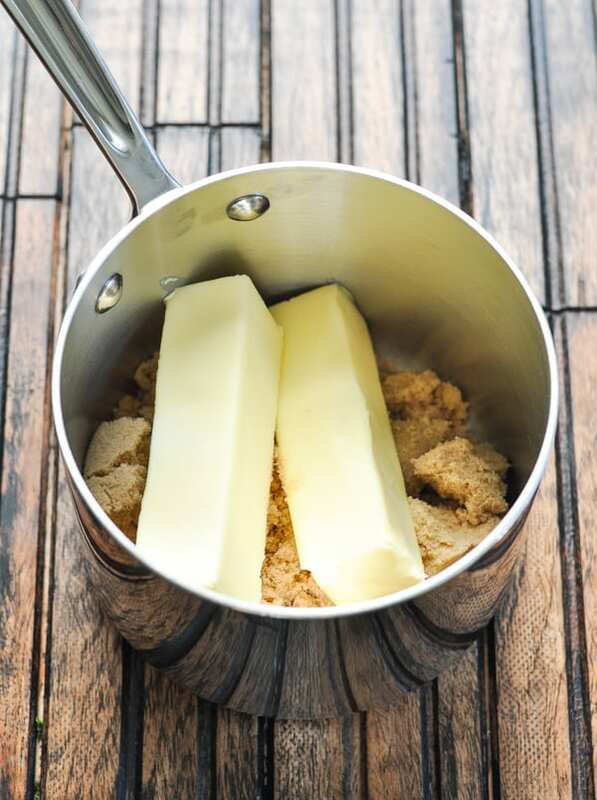 Mix butter and brown sugar in a saucepan. Boil for two minutes, stirring frequently. 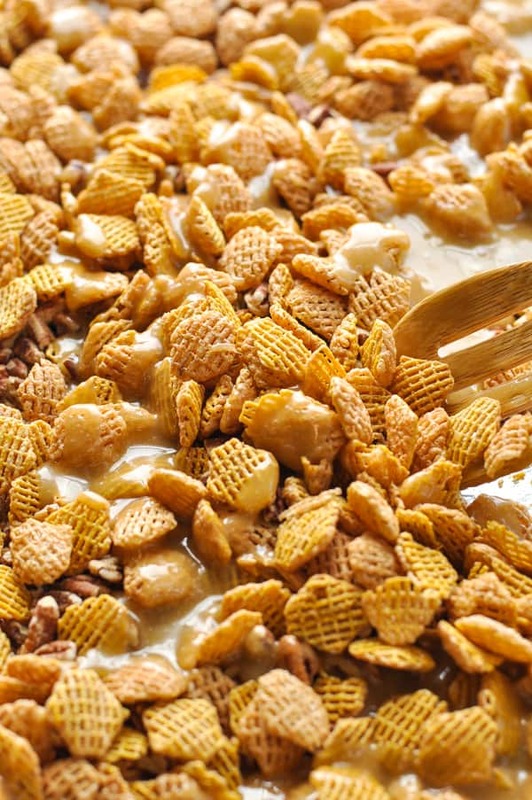 Pour caramel mixture over cereal and nuts; toss to coat. Bake for 8 minutes. Remove from oven, stir, and bake for an additional 8 minutes. Allow to cool, breaking apart any large clumps with a wooden spoon or spatula. This recipe was originally published in January, 2014. It was updated in October, 2018. Oh my this looks so good, I would eat the whole bowl 🙂 I pinned this and am checking it out from I should be mopping the floor link party! Hi Cathy! Thanks for stopping by! Hi!!! I want to take this with me on a vacation flying as a gift in a gift bag. Does this stay fresh very long? Also can it be frozen? Hi, Christy! I’ve never tried freezing it, but I think it would work fine! And yes — it keeps well in an airtight container for at least a couple of weeks (maybe longer…it’s just always consumed faster than that)! Yum!! I love chex mix!! Especially the sweet kind! Awesome! Your additions sound delicious! !